This book provides the guidelines and fundamental methods of estimation and calculation needed by maintainability engineers. It also covers the management of maintainability efforts, including issues of organizational structure, cost, and planning processes. Questions and problems conclude each chapter. CHAPTER 1: INTRODUCTION. What is Maintainability?. The Importance, Purpose, and Results of Maintainability Efforts. Maintainability in the Government Procurement Process and in the Commercial Sector. Maintenance Engineering Versus Maintainability Engineering. Maintainability Science and Downtime. Maintainability Standards, Handbooks, and Information Sources. Maintainability Terms and Definitions. Problems. References. CHAPTER 2: MAINTAINABILITY MANAGEMENT . Introduction . Maintainability Management Functions in the Product Life Cycle. Maintainability Organization Functions and Tasks. Maintainability Organizational Structures. Maintainability Program Plan. Personnel Associated with Maintainability. Maintainability Design Reviews. Problems. References. CHAPTER 3: MAINTAINABILITY MEASURES, FUNCTIONS, AND MODELS. Introduction. Maintainability Measures. Maintainability Functions. System Effectiveness and Related Availability and Dependability Models. Mathematical Models. Problems . References. CHAPTER 4: MAINTAINABILITY TOOLS. Introduction. Failure Mode, Effects, and Criticality Analysis. Fault Tree Analysis. Cause and Effect Diagram. Total Quality Management. Maintainability Allocation. Problems. References. CHAPTER 5: SPECIFIC MAINTAINABILITY DESIGN CONSIDERATIONS. Introduction. Maintainability Design Characteristics. Standardization. Interchangeability. Modularization. Simplification. Accessibility. Identification. Accessibility and Identification Checklist. General Maintainability Design Guidelines and Common Maintainability Design Errors. Problems. References. CHAPTER 6: HUMAN FACTORS CONSIDERATIONS. Introduction. Human Factors Problems in Maintenance and Typical Human Behaviors. Human Body Measurements. Human Sensory Capacities. Environmental Factors. Auditory and Visual Warning Devices. Selected Formulas for Human Factors. Problems . References. CHAPTER 7: SAFETY CONSIDERATIONS. Introduction. Safety and Maintainability Design. Electrical, Mechanical, and Other Hazards. Safety Analysis Tools . Safety and Human Behavior. Safety Checklist. Problems. References. CHAPTER 8: COST CONSIDERATIONS. Introduction. Costs Associated with Maintainability . Reliability Cost. Discounting Formulas. Life Cycle Costing. Maintenance Cost Estimation Models. Maintainability, Maintenance Costs, and Cost Comparisons. Problems. References. 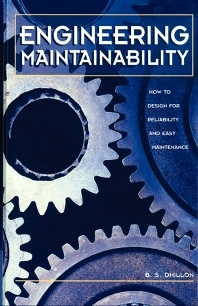 CHAPTER 9: RELIABILITY-CENTERED MAINTENANCE. Introduction. The Definition of Reliability-Centered Maintenance. The RCM Process. RCM Implementation. RCM Review Groups . Methods of Monitoring Equipment Condition. RCM Applications and Achievements . Reasons for RCM Failures. Problems . References. CHAPTER 10: MAINTAINABILITY TESTING, DEMONSTRATION, AND DATA. Introduction. Planning and Control Requirements for Maintainability Testing and Demonstration. Test Approaches. Testing Methods. Preparing for Maintainability Demonstrations and Evaluating the Results. Checklists for Maintainability Demonstration Plans, Procedures, and Reports. Testability. Maintainability Data. Problems. References. CHAPTER 11: MAINTENANCE MODELS AND WARRANTIES. Introduction. Maintenance Models. Warranties. Problems. References. CHAPTER 12: TOPICS IN RELIABILITY. Introduction. Reliability and Maintainability . Bathtub Hazard Rate Concept. Reliability Terms, Definitions, and Formulas. Static Structures. Dynamic Structures. System Availability. Reliability Data Sources. Problems . References. Index. B.S. Dhillon, Ph.D., is chairman of the department of mechanical engineering at the University of Ottawa. He has published widely on maintainability engineering and other engineering issues, and received numerous awards for his work in the fields of maintainability and reliability engineering.